Ce fard à joues, je l'ai dans ma collection depuis déjà un certain moment mais je n'avais pas encore pris le temps de vous en parler plus. 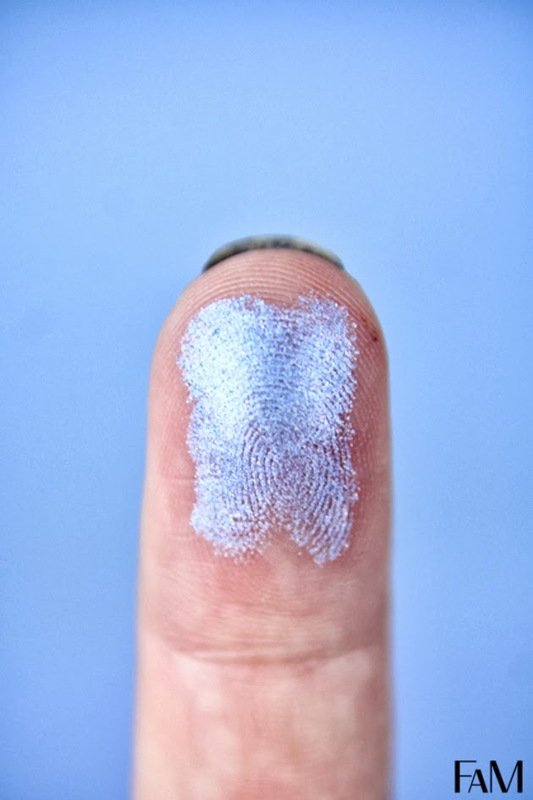 Vous l'aurez deviné, il est neutre, donc parfait pour tous les types de peau, certainement pas pour les peaux foncées mais pour la majorité des femmes. C'est un joli vieux rose avec un peu de brun. 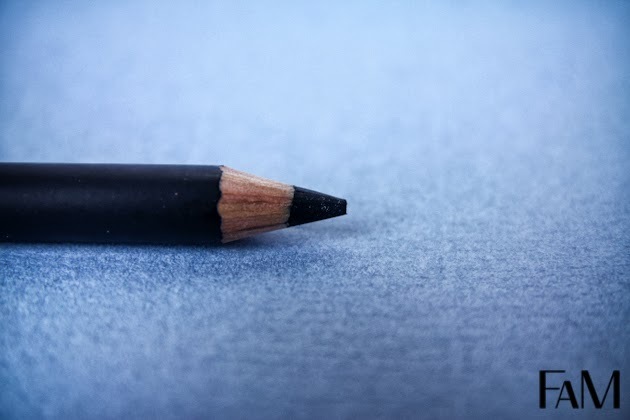 Le fini est matte et léger et si facile à porter pour la vie de tous les jours. C'est aussi le parfait "dupe" pour "Exposed" de Tarte amazonian clay. 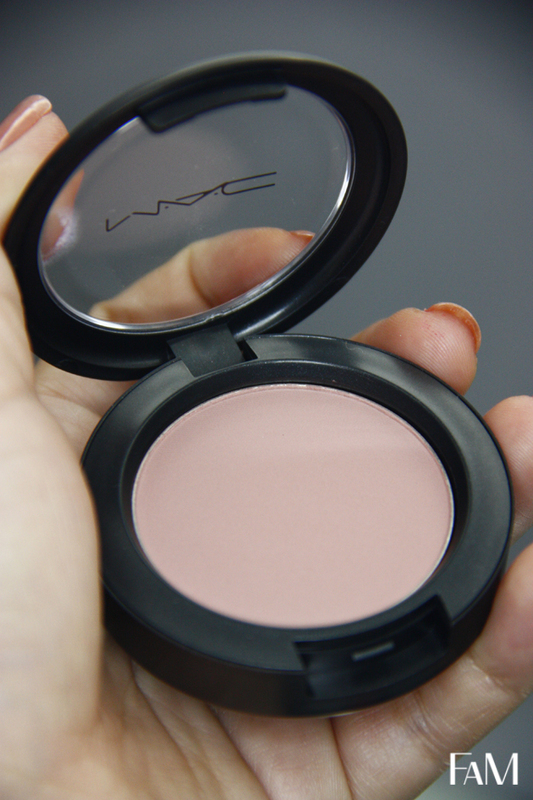 This blush, I have it in my collection for quite some time but I had not yet taken the time to talk about it a little bit more. 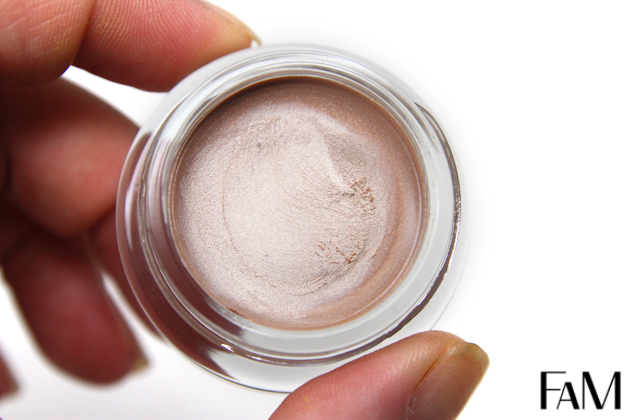 You guessed it, it is neutral, so perfect for all skin tones, certainly not for darker skin but for the majority of women. 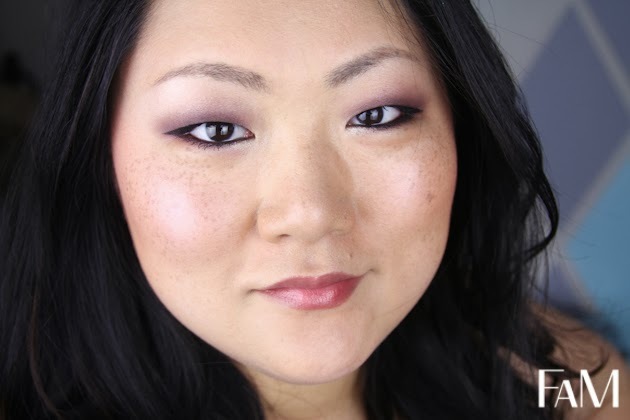 This is a pretty old pink with a little bit of brown. 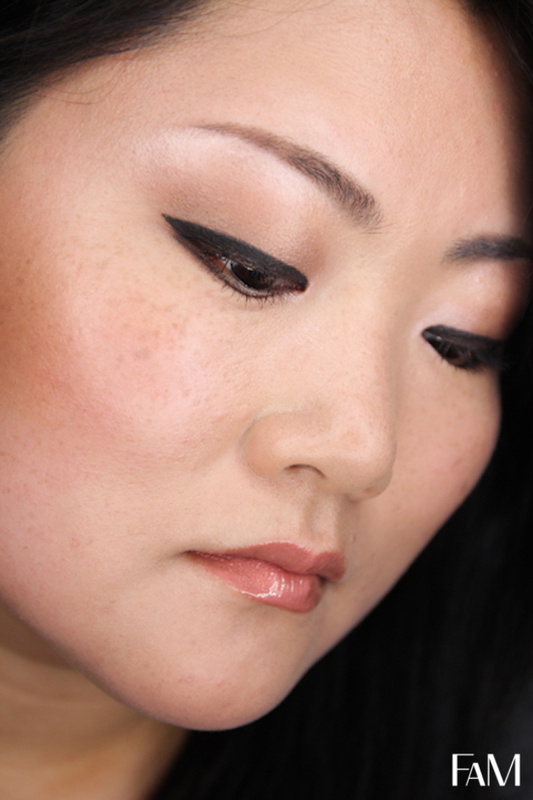 The finish is matte and lightweight and easy to wear for everyday life. 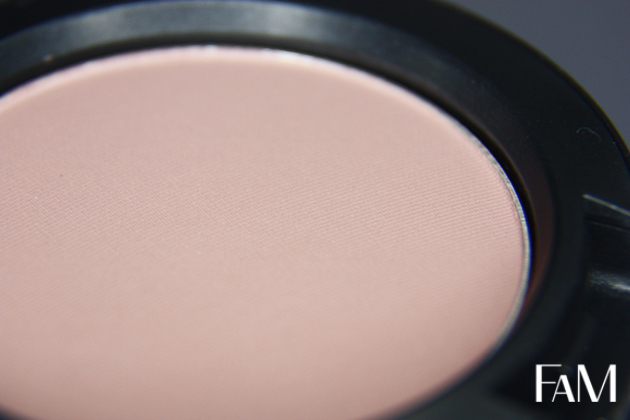 It is also the perfect "dupe" for Tarte amazonian clay in "Exposed". 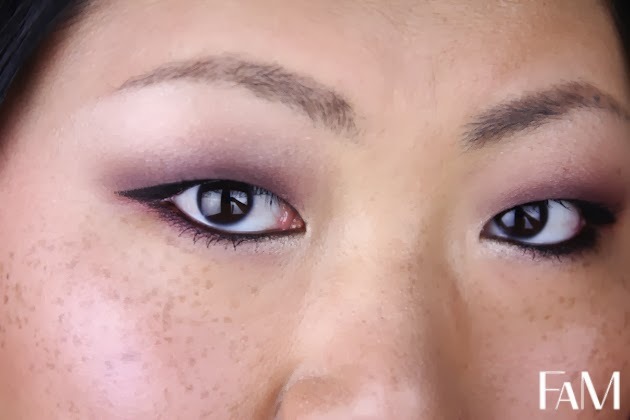 Here is a fall look using some of my favorite products of the moment, especially purple shades from my Mac eyeshadow collection. 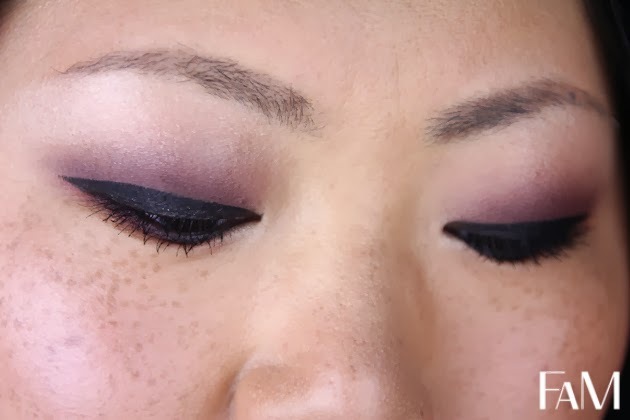 This time I am using Cranberry on the lower lash line and Blackberry on the 1/3 of my lids (from the lashes to the brows) and over a new Mac paintpot eye base product, Stormy pink which is also a purple-y color but lighter than the others (It looks like Quarry from Mac, a nice muted purple shade) and for highlight, another cream product, but from Maybelline this time, this wonderfull Color Tattoo champagne color, Barely Branded, I applied the product in the inner conner of the eye and on the brow bone as usual. 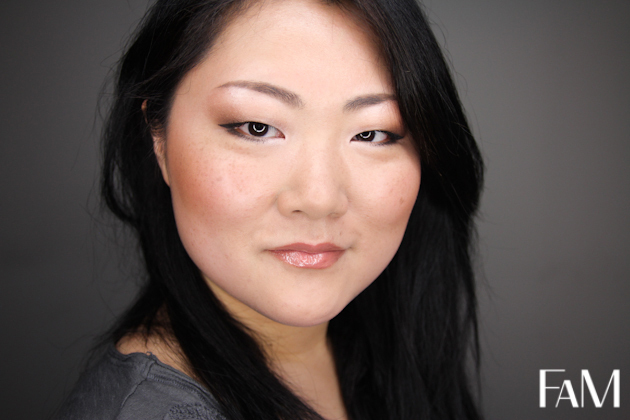 You can notice that I use a black eyeliner, from Urban Decay, my favorite, Perversion on the rime of my rimes and as an eyeliner, plus few layers of my Lancome Hypnose mascara on the top and lower lashes. 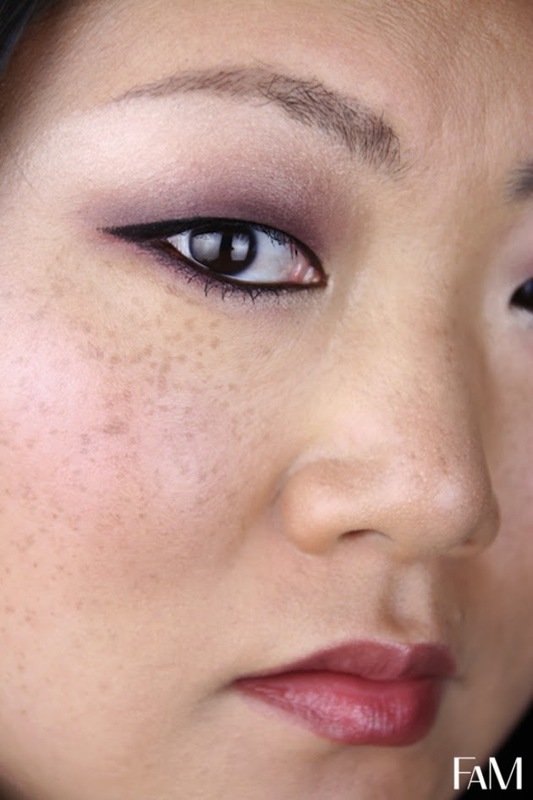 I also used a berry lip color that I really like for fall from Clinique, Chic Honey, a pretty lipstick/lipbalm, that is very dark in the bullet but very easy to wear as it is sheer on the lips letting only a hint of tint on the lips. 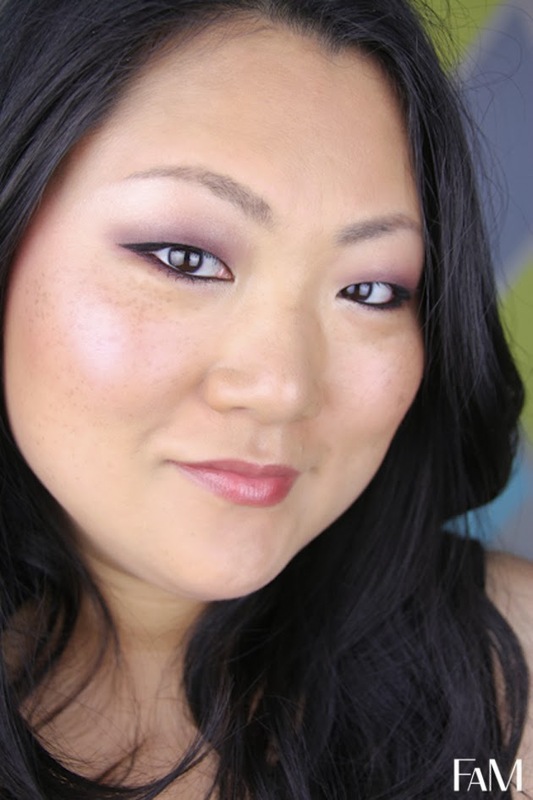 You can find the rest of the products I used on my face in the bottom of this page! 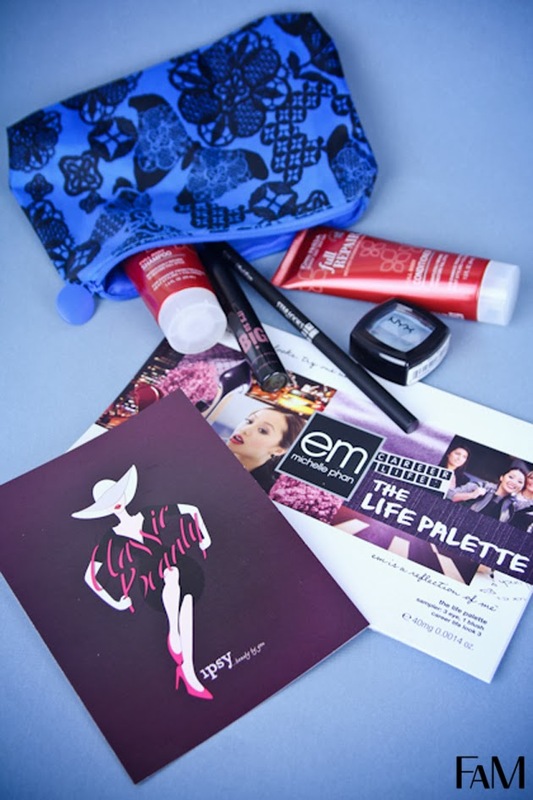 This september Ipsy bag is cool, full of makeup and some nice hair care products that I'm sure will like. 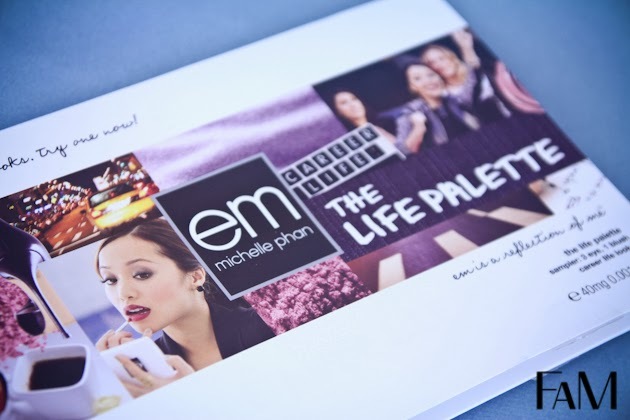 ...and of course some adverts and samples for Michelle Phan and her new cosmetic line...why not. But I would say that I don't really care about it. I heard so many reviews and test that are not really positive, especially the cost of her products that apparently does not worth it. 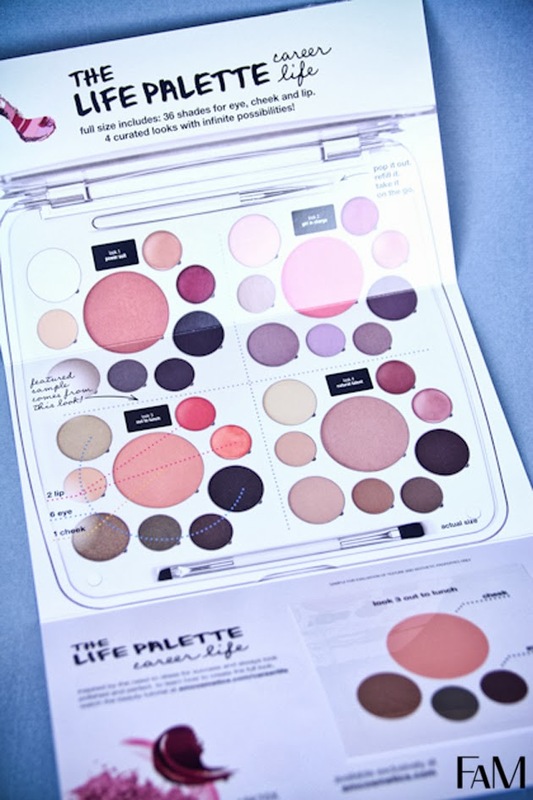 This is just a picture of the real size palette, huge! I like the colors of this palette, this is typicaly what I wear! 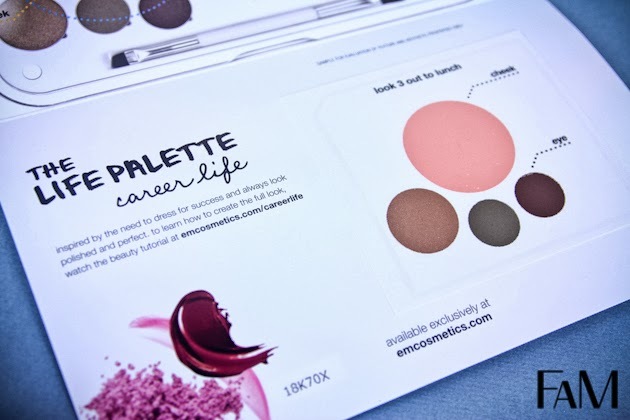 This is the sample itself, a peachy blush and 3 eyeshadows from the life palette in its "Career life". 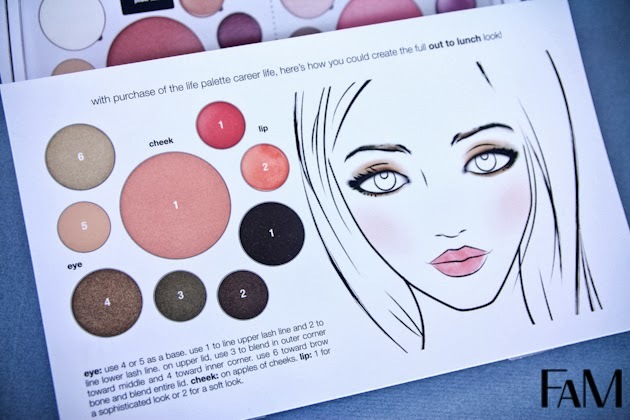 Here a face chart a an example of a look that you could recreate with this palette and especially with the sample I received. I think a photo would have been more explicite than a manga face. So this is what I've got! 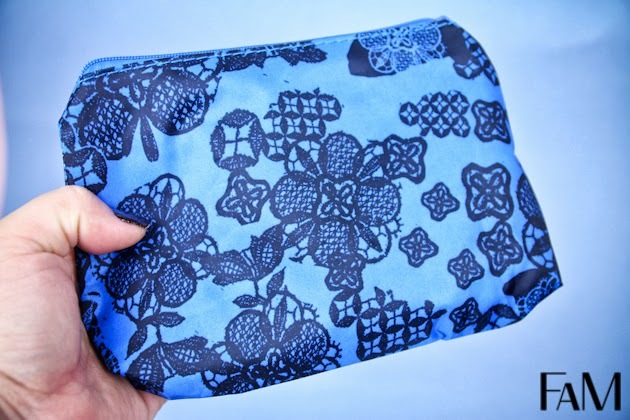 A nice small bleu bag, that I can easily bring with me, which is not too girly. 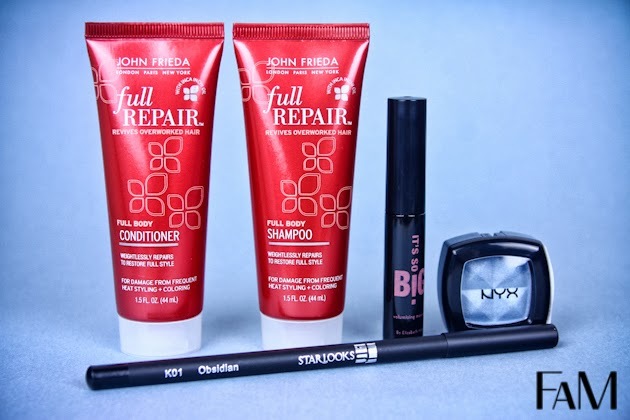 2 full size makeup products! 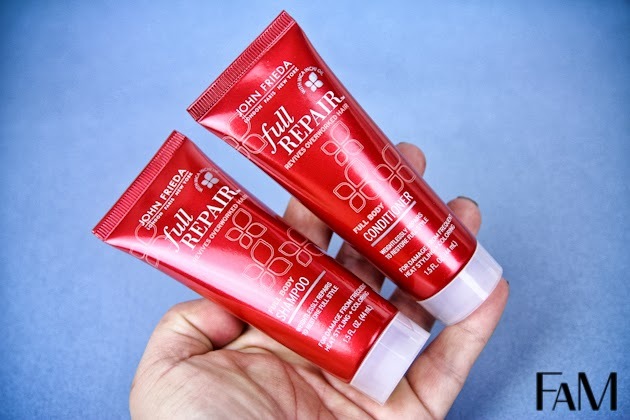 First: These two red products are some haircare products from John Frieda, A brand that I usualy trust because they are really good! 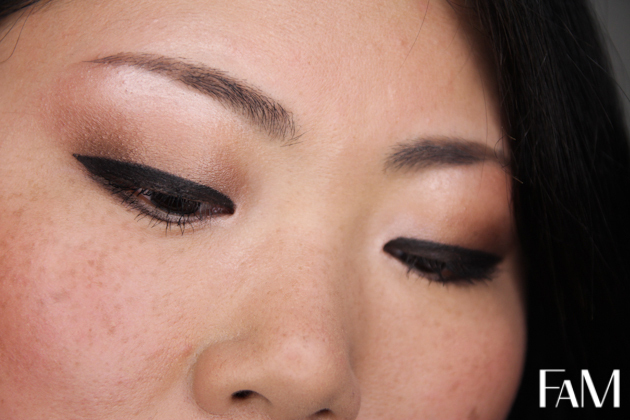 We can't really see from the picture, but it has some tiny sparkle in it. 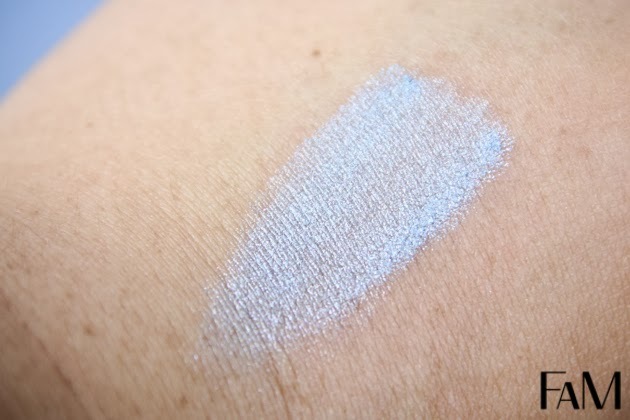 Here the swatches, I would say that it does not glide as smooth as I like and I really don't know anything about its long-lasting properties yet. 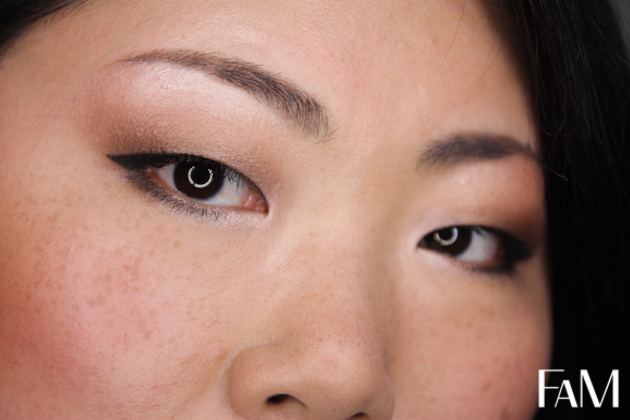 I hope it does not smudge like crazy on my monolid. 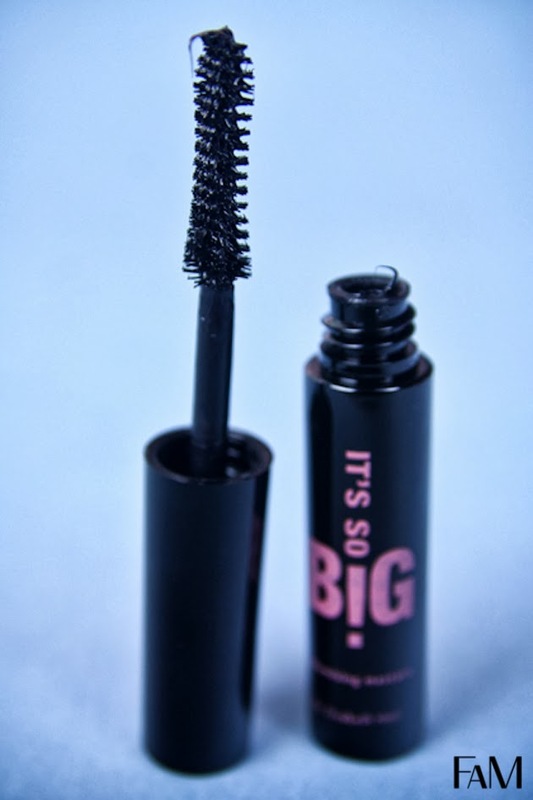 Here a deluxe mascara sample...I don't know the brand, never heard of it. 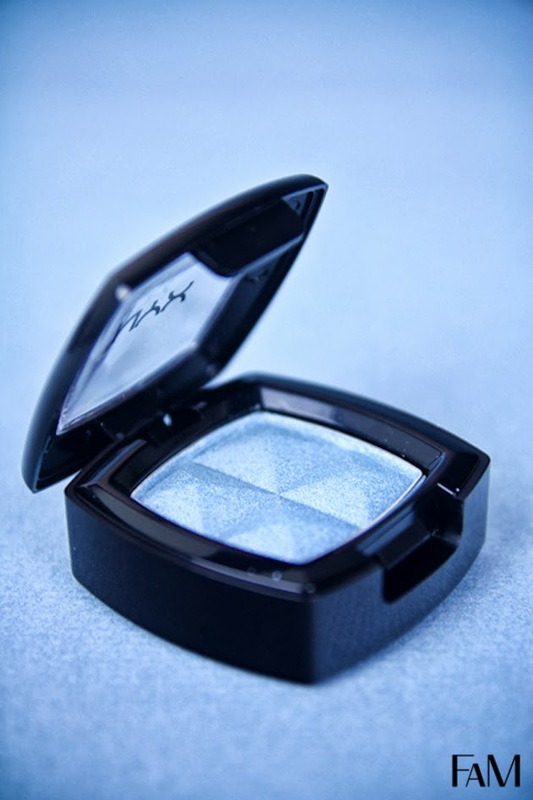 And last but not least, a NYX full size eyeshadow with a beautiful shade of blue. It's not too bold so I hope I could use it sometimes. 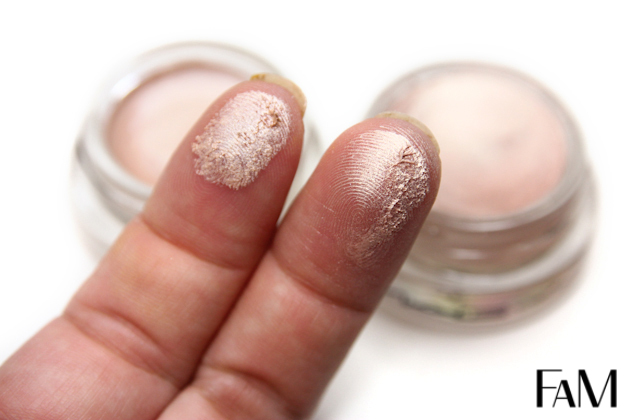 This is my first NYX eyeshadow and I can already say that I like the texture of the product which is super creamy and pigmented. 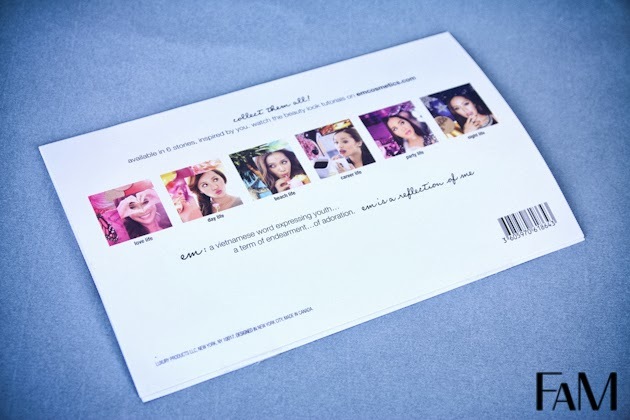 -Huge samples, which is always good to test the product. 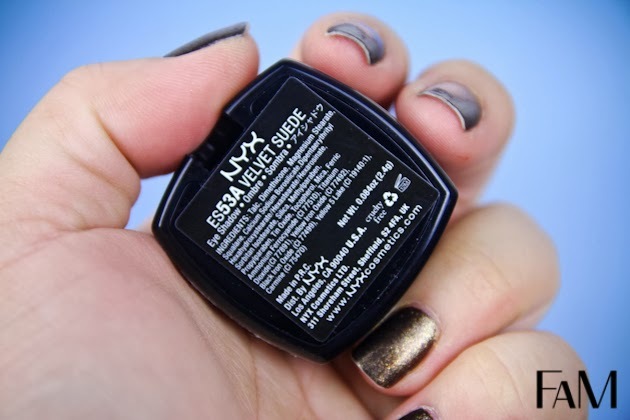 -Like the NYX eyeshadow even if the color is not easy to wear. 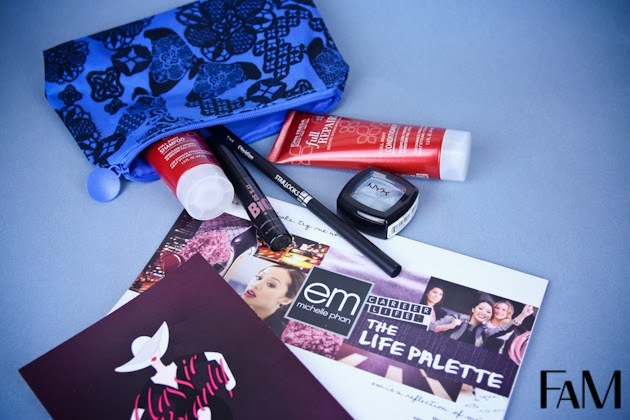 -Really exited by the hair products, love this brand! 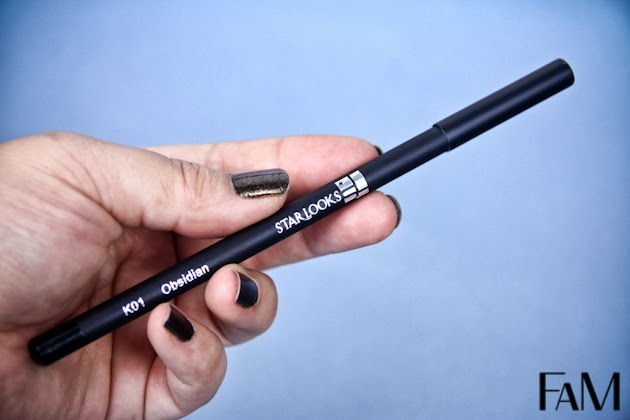 -I don't like to recieve products that I don't know the brand :( (eyeliner and mascara) It is hard to tell if the quality is nice of cheap. 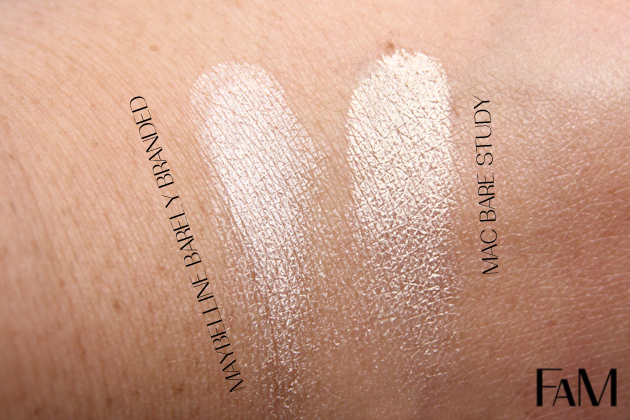 Je viens de trouver quasiment la parfaite copie de Bare Study de Mac, chez Maybelline, dans leur gamme Color Tattoo Metal, avec la teinte Barely Branded. 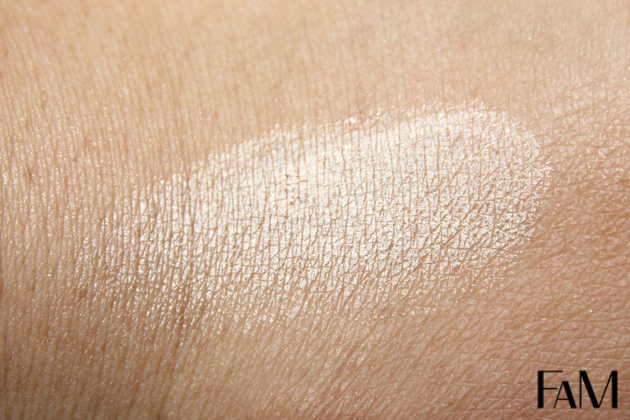 Cette couleur champagne est absolument divine, appliquée comme une base à votre maquillage, ou comme fard crème pour illuminer le regard. 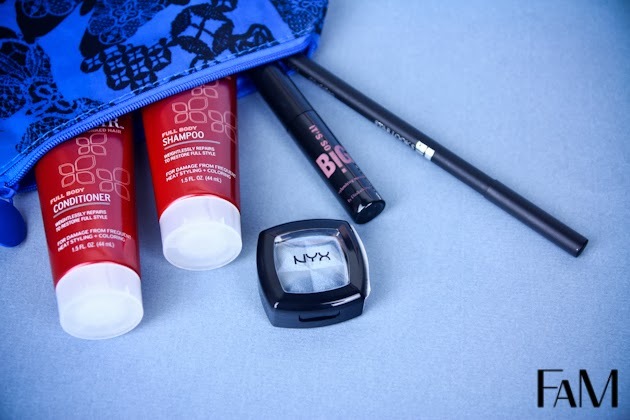 Décidément, Maybelline me surprend vraiment très positivement ces derniers temps, car la qualité de ses produits ne cesse de s'améliorer! 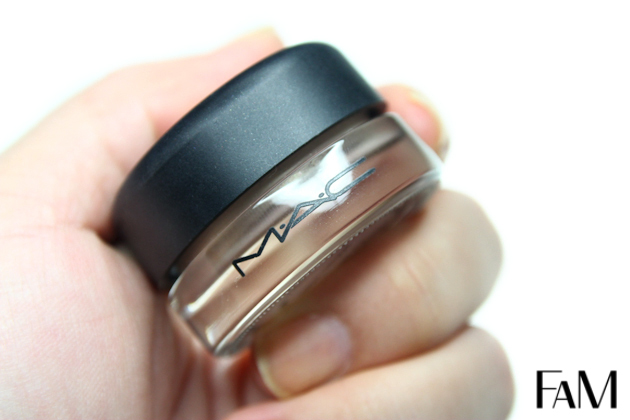 Here is a dupe alert! 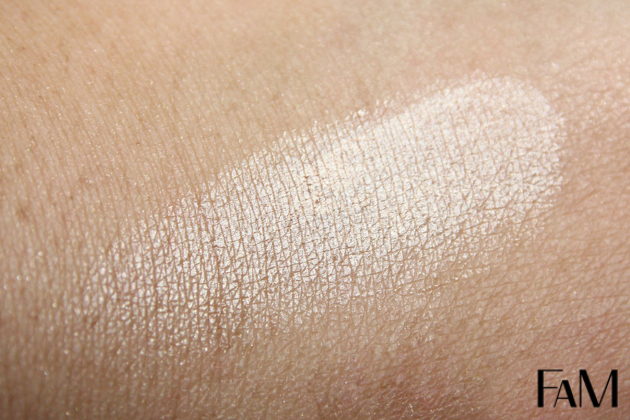 I bought recently the dupe for Mac Bare Study, this really beautiful Maybelline color tattoo Metal in Barely Branded. 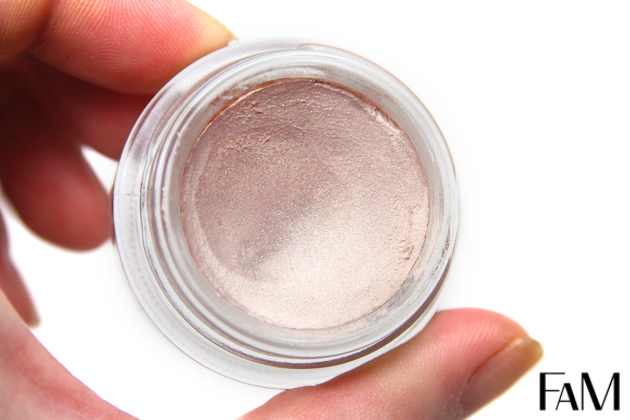 This is a nice shimmery champagne cream eyeshadow that I love to use as a base or itself, as an highlight on my eyelids. 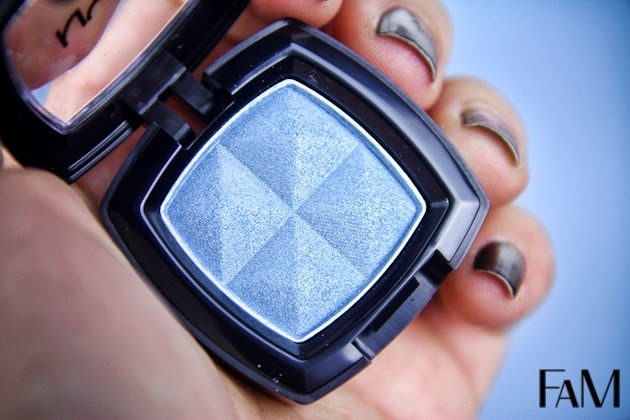 Maybelline is doing such a nice job these past few years, its quality is improving all the time and this is really cool for our budget! 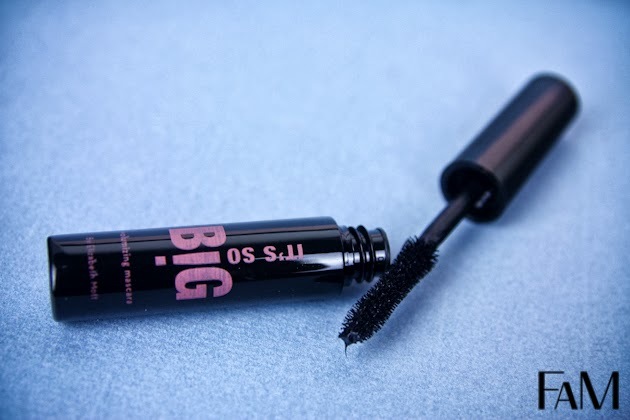 Le packaging est lui aussi, très semblable, sauf que Mac contient plus de produit, 5g contre 4g chez Maybelline. 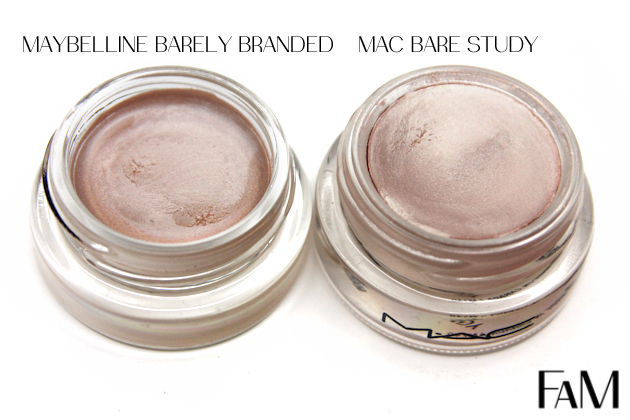 The packaging is quite similar but Mac product contains a little bit more product, 5g vs 4g for Maybelline. Vous pouvez le constater vous même, les deux produits sont très similaires point de vu couleur et je vous le confirme, la texture est aussi proche! 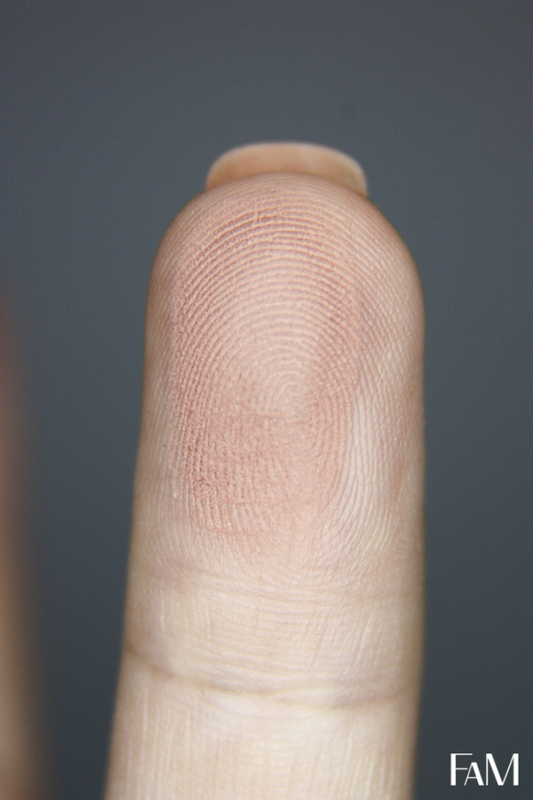 Je dirais que Barely Branded est plus rosé que Bare Study qui lui, tend plus vers le beige, mais il faut vraiment être pointilleux! You can see, there is not much difference between them... and I can confirm that the texture is quite the same too! 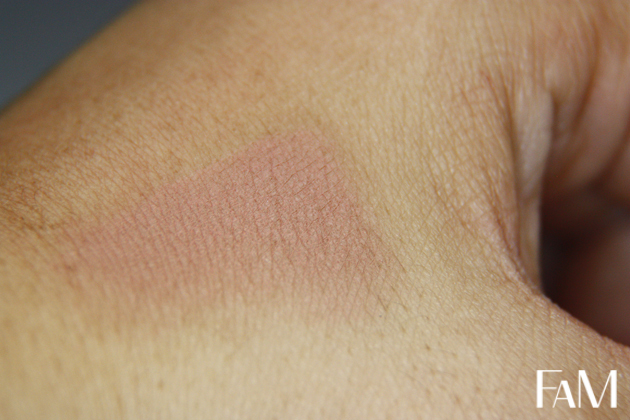 I would say that Barely Branded is more on the rosy side while Bare Study has more yellow undertone. 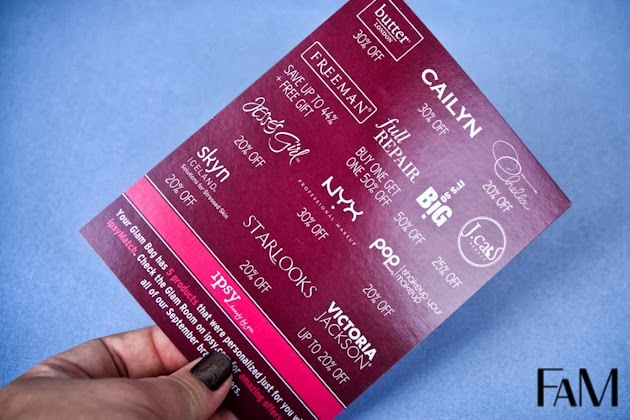 Je dirais que les deux produits se valent quasiment à 100%, peut-être que Maybelline le remporte d'un petit point sur la durée du produit qui semble tenir plus longtemps sur les paupières. 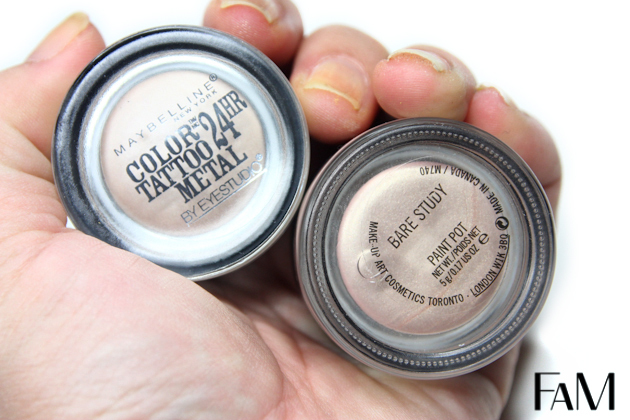 Ces deux produits sont très très similaires d'un point de vu de la couleur, Maybelline Barely Branded a une teinte légèrement plus rosée que Bare Study de Mac. 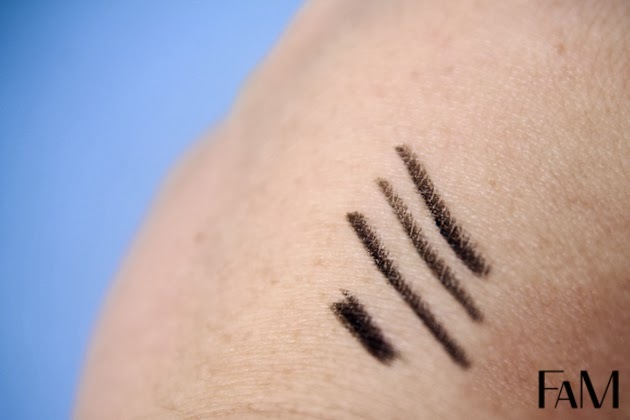 Forcément, le prix est plus avantageux du côté de chez Maybelline mais nous avons 5g de produit chez Mac tandis que Maybelline, 4g. 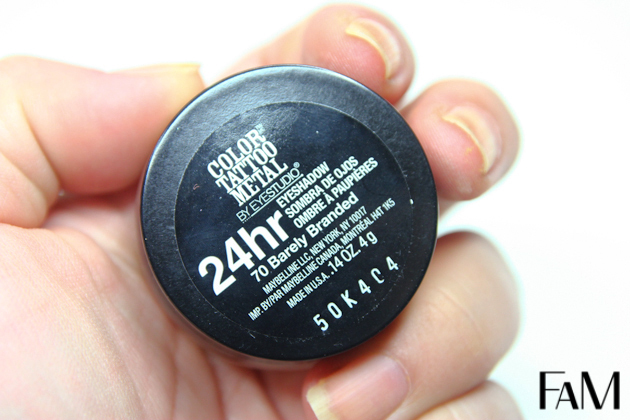 Same texture but I would say that Maybelline is more long lasting, it stays on all day and all night! 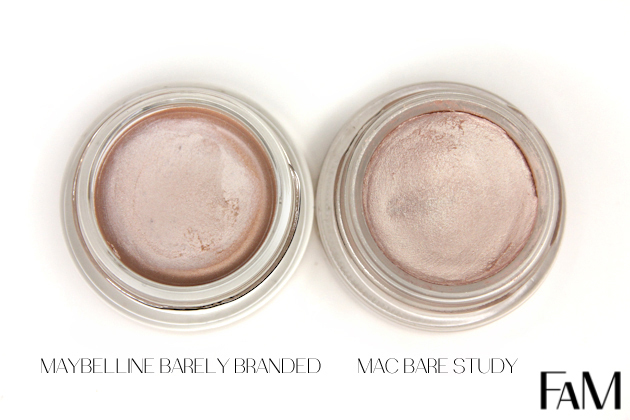 Maybelline Barely Branded is more on the rosy side while Bare study has beige/yellow undertones. 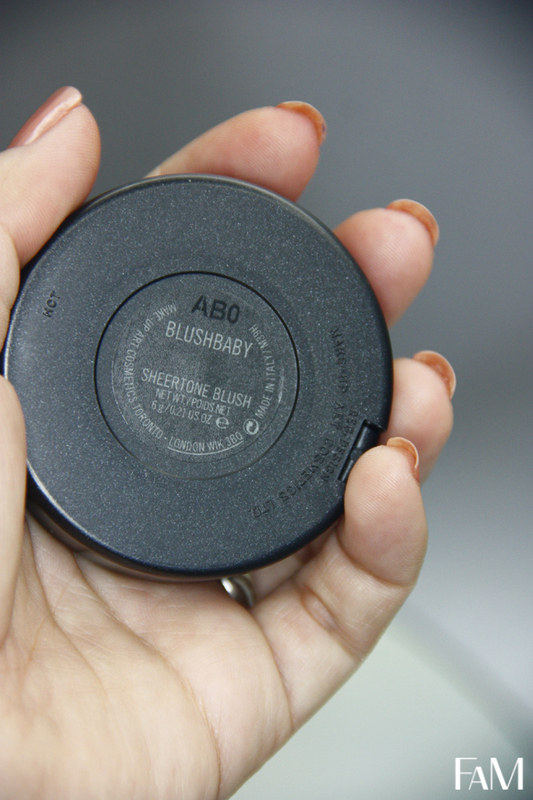 Of course, Maybelline is more budget friendly but contains less product, 4g while 5g for Mac. 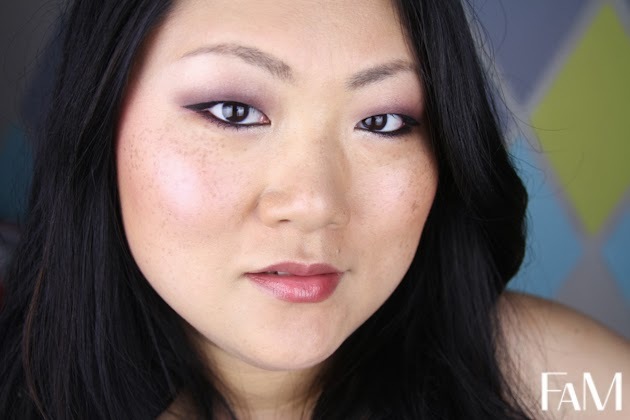 Face of the day: An everyday bronze look.